Destinations all over Europe seem to be leaping to life with the arrival of spring. A wealth of vibrant colours and luscious landscapes – scenes of natural beauty stretch out as far as the eye can see. Dripping in fantastic floral displays and shedding any sign of winter, things are finally starting to heat up for holidaymakers. Wave goodbye to the UK's 'April showers' and say hello to spellbinding Cyprus and Sicily! Here's our lowdown on where's hot in April. Not to be outdone, Sicily knows it's all about first impressions – and what a statement this Italian island makes! Dramatic brooding volcanic landscapes and standout scenery is pinch-me perfect, with the iconic Mount Etna watching over it all with spellbinding splendour. The largest of all the Mediterranean islands, and heart of the whole show – Sicily will undoubtedly knock you sideways. A pleasant 19°C (and counting) in April, it's the opportune time to traverse the wealth of scenic and cultural attractions. A holiday rule of thumb tends to put beaches at the top of the list, and why not? Sea, sand and splash often makes for the most memorable moments. Sicily's collection of dramatic cliff faces, secluded bays and rocky coastline keeps things interesting for even the fussiest of beach seekers. There's plenty of golden sands for sunbathers, but the island's unique and quirky coves are perfect for those searching for something a little different. 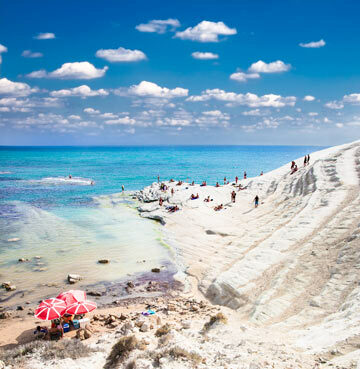 You won't find anywhere quite as extraordinary as Scala dei Turchi. Mother Nature has lovingly crafted terraces of dazzling limestone and white marl against an intense blue sea. A showstopping sight to behold at any time of day, its unbridled beauty only intensifies as the sun sets. 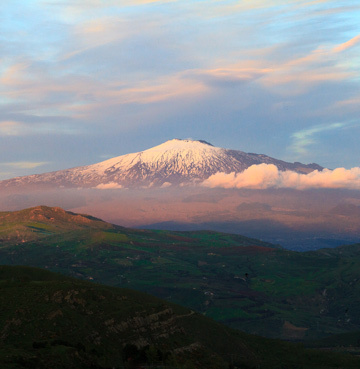 You can't visit Sicily without taking a trip to the tallest volcano in all of Europe. Towering over the city of Catania and east coast, Mount Etna is visible from over half the island on a clear day! Worlds away from lazy beaches, olive groves and lemon trees – the stark landscapes of Etna are striking in more ways than one. Black sands, volcanic craters and oozing lava are the iconic features of this Sicilian symbol, and she is very much still active! Adventuring around the national park is made easy with cable cars, jeep tours and even a railway. Of course, you can't beat some good old fashioned hiking, and nature lovers are spoilt for choice when it comes to trails. Culture vultures and history buffs will relish hunting down remnants in time. Part and parcel of Sicily's rich identity – Roman, Byzantine, Islamic and Greek influences (to name a few) are sprinkled from coast to coast. Jam-packed with amazing architecture, magnificent monuments and treasured temples, get ready for an onslaught of awe-inspiring archaeological sites. 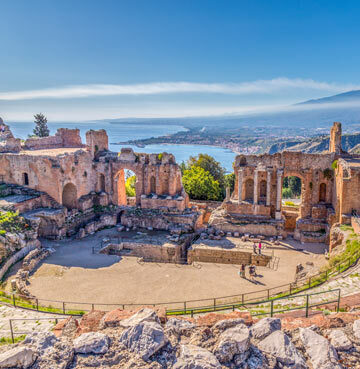 Taormina's ancient theatre is unmissable. Perched high on a cliff, the panoramic views of Etna and the glittering sea are reason enough to stop by this picturesque old town! It's a well-known fact that Italy is one of the most romantic destinations on earth, and Sicily doesn't disappoint! Effortlessly elegant – it's a couple's paradise teeming with gorgeous gastronomical delights and wonderful world-renowned wines. Serving up an irresistible blend of intimate eateries and picture-perfect restaurants, foodies will be in their element as they sample local cuisines by candlelight. Easter in Sicily will afford travellers the chance to experience some of the island's fantastic festivals first hand. Celebrations begin in March and continue into April. Watch elaborate processions and parades serpentine through stunning squares and narrow streets. A tremendous time of year to visit for food lovers, there's plenty of mouthwatering treats on offer to tantalise your taste buds! Tuck in to Sicily's signature sweetened ricotta cheese cake, Cassata, and marvel at the bread displays and marzipan creations. Beloved by travellers the world over, and for good reason – spectacular Cyprus represents everything that makes the Mediterranean so magical! Untamed natural beauty, understated elegance, timeless charm and sun-soaked shores. 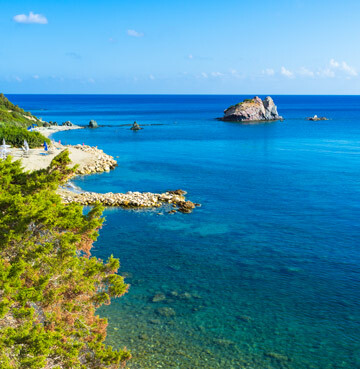 Cyprus in April treats its visitors to highs of 24°C. Ideal for just about any activity, and still comfortably cool for outdoor pursuits, it's the month for nature lovers to get out and explore all this diverse destination has to offer. Cyprus and the great outdoors go together like walking boots and nature trails. Which, it turns out, is quite fortuitous – as there's plenty of those to go around. Tackle challenging paths that weave up the side of rocky mountains, or stroll through tranquil forests that meander next to gentle streams and across mighty rivers. The adventure playground of outdoor activities dominates most of the island, but some key hotspot highlights sit in the northwest. Akamas Peninsula National Park covers a whopping 230 square kilometres with valleys, gorges and wide sweeping bays. Including the amazing Avakas Gorge. Here you'll find a trail that takes you roughly two and a half kilometres through the gorge, with sheer rocks on both sides towering 260 feet in height. The narrowest section is just ten feet wide! A whole host of wonderful wildlife calls the National Park home, from reptiles to wild mountain goats. April is one of the best months for walking the legendary landscapes of Aphrodite's birthplace. The mighty Troodos Mountains sit in the island's interior and stretches out towards the west. Carpeted with pine trees and peppered with quiet mountain villages and ancient monasteries, it's a fascinating area to explore. The exquisite UNESCO listed Byzantine churches are proof that you should never judge a book by its cover. Plain exteriors give nothing away when it comes to the beautiful décor that awaits inside. Be sure to pop into at least one of these inspiring cultural creations! Cyprus' natural diversity is matched only by its historic heritage. 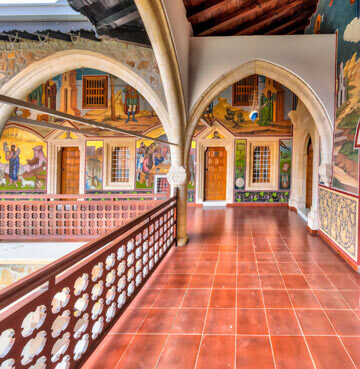 Paphos is bursting with beautiful craftsmanship from the centuries. A treasure trove of cultural goodies, Kato Paphos Archaeological Park tops most bucket lists. A UNESCO World Heritage Site since the 80s, it's one of the island's top attractions. 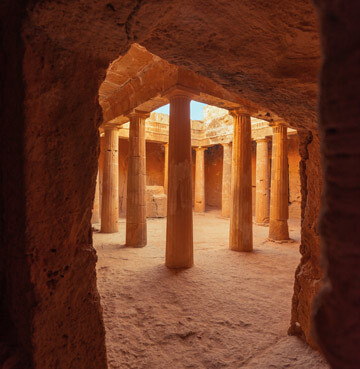 From the Hellenistic theatre cut into the rocky hillside, to the magnificent mosaic floors of Roman villas and the Tomb of the Kings – it's an unmissable experience for culture vultures. Visiting in April will allow you to step back in time and immerse yourself without the large crowds of sightseers that arrive in the summer months. With a destination as diverse as Cyprus, it'd almost be a disappointment if those fabulous traits didn't make it into the food. Fortunately for foodies, the idyllic island is the gift that keeps on giving! With menus as varied and bursting with flavour as you might hope. Taverna tables groan under mountains of mouth-watering meze dishes, while cheese lovers must be sure to order a plate of heavenly halloumi. Whatever you do with your stay, tear yourself away from the towel and adventure beyond the sun-soaked sandy beaches. Cyprus deserves nothing less.